We have selected 2 best air compressor for home garage. Air compressors are relatively simple devices. But that does not mean that all compressors are created equal. You have a wide range of different types of air compressors. An air compressor is a simple device, made up of a motor that pushes air into a storage tank. The compressed air is then used to power pneumatic tools. The most basic model is an inflator that can be used to inflate small objects such as tires. Larger air compressors are used to power pneumatic tools. Air compressors are often divided into two categories, consumer models for use at home and commercial models for professional use. The categories are not strictly defined but commercial models are more powerful and can be used for longer periods of time. Needless to say, the commercial models are more expensive as well. Here are some of the most popular air compressors. The Bostitch CAP2060P is an oil-free air Best Pancake Compressor. This is a mixed blessing, no oil means less hassle but oil-free compressors are noisier and seldom last as long as oil compressors. The Bostitch CAP2060P confirms this view. Like most oil-free air compressors, it is cheap and lightweight. But unfortunately, it is also noisy and not very reliable. 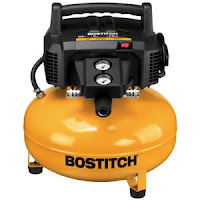 Despite being a 6 Gallon compressor, the Bostitch CAP2060P is still relatively lightweight, 51 pounds. It is reasonably easy to move around. It is very good for nailers and staplers but it is not a heavy-duty compressor. The large tank means that refills are seldom necessary. Like many other air compressors, the vendor does not recommend the use of extension cords. Instead, you should extend the length of the airline. If you must use an extension cord, Bostitch recommends 12 Gauge extension cord for distances less than 25 feet and 10 Gauge for distances between 25 and 50 feet. If you use anything smaller, the compressor is unlikely to start. The main problem with the CAP2060 is reliability. A lot of owners have reported that their unit is broken. This seems to happen even if the compressors have not been used much. This is, of course, a bad sign. Like many other oil-free compressors, plenty of cheap parts have been used. The CAP2060 Pancake Compressor comes with a 1-year warranty. The safety valve is pre-set to 140 PSI. Most of the customers are either very happy or very unhappy with their Bostitch CAP2060P air compressor. The happy customers have a working air compressor while the unhappy customers fairly soon had a broken unit. Given the many broken units, we can’t recommend the Bostitch CAP2060P. As long as it works, it is a good air compressor but of course, it is useless once it is broken. Oil-free air compressors are not very reliable but it looks like the CAP2060P has more problems than most of the competitors. Since it is fairly expensive, it is understandable that a lot of people are hesitant to give it a try. If you are looking for a good oil-free air compressor, we recommend that you have a look at the DEWALT D55167 compressor. The Ingersoll Rand SS3L3 air compressor promises you industrial quality. Given the heavy price tag, you certainly want a heavy duty air compressor. At first sight, the Ingersoll Rand SS3L3 compressor looks impressive. Durable cast iron construction makes it very sturdy. The vertical design means that the footprint is relatively small for a 60-gallon tank. The SS3L3 3 HP Air Compressor is oil lubricated and is a single stage air compressor. It is easy to use and does not require much maintenance. The large size and heavy weight (300 pounds) make it difficult to move. Clearly, this is an air compressor you put in one place and keep it where. Note that since this is an industrial grade air compressor, you can’t plug it into your standard 120 Volt wall outlet. The Ingersoll Rand SS3L3 requires 230 Volt AC, single phase. So before buying this air compressor, make sure that you have the power that is required. The Ingersoll Rand SS3L3 has a tank made of high quality cast iron. Unfortunately, it looks like not all parts are of high quality. Some of the units have broken down after a while. The SS3L3 does not seem to be suitable for heavy duty usage. Given the high price, you should get an excellent air compressor. We think you can get better value for your money. That said, as long as Ingersoll Rand SS3L3 air compressor works, it is a good unit. The Ingersoll Rand SS3L3 air compressor is UL/CSA/ASME compliant and meets the OSHA standards. It comes with a 1-year warranty. Except for the manual, the SS3L3 air compressor does not come with any accessories. I bought this compressor to replace a six-year-old Porter Cable 60 gallon unit that broke down after about six years of moderate use (turned out to be motor capacitors that were easy to replace). This unit seemed to be a step up from the Porter Cable so I spent the extra money and “upgraded”. The Ingersoll Rand SS3L3 air compressor looks like a heavy-duty compressor but some of the customers that have tried to use their SS3L3 air compressors have ended up with a broken unit. Given that the Ingersoll Rand SS3L3 is relatively expensive, we think that you can get better deals. 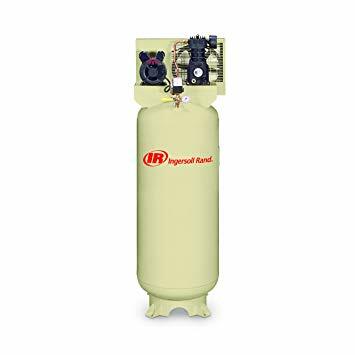 We think that the Campbell Hausfeld VT6275 15 Amp 3.2-Horsepower 60-Gallon Oiled Vertical Compressor gives you better value for your money.